With the penchant of modern-day people for streamlined, built-in and minimalistic home appliances and fixtures, it’s not surprising to see glass top stoves making a permanent mark in the cooking appliances industry. A lot of homeowners are drawn to its many features that trump those of traditional, raised or standalone stovetops. Not only are glass top stoves easier to look at, they are also easier to maintain. Which kitchen can’t be improved with the simple addition of these stovetops? They definitely go a long way in making spaces look cleaner and more organized. On the other hand, glass can be susceptible to damages. This is why you shouldn’t just use any cookware if you have this type of stove top in your kitchen. You would want your glass top stove to last for a long time. Don’t worry because finding a cookware suitable for glass top stoves isn’t difficult. There is a plethora of cookware out there that you can add to your cooking arsenal. I took it upon myself to find the best cookware compatible with glass top stoves. Why should you get a glass top stove? What Are the Criteria in Choosing the Best Cookware for Your Glass Top Stove? Best Cookware for Glass Top Stove – Which One Should You Go For? The biggest drawback of glass top stoves is the delicate glass material. When subjected to force or pressure, there’s a good chance it will break. You’re probably wondering why you should get these stove tops in the first place if they are so flimsy and prone to breakages. Despite the drawbacks, there are definitely some upsides that would make a serious home cook so consider using it. For one, this kind of stove top does a great work in distributing heat. Unlike other types of stove tops that might produce uneven heat, this one ensures that there is even distribution of heat, thereby heating up the pan effectively. What it does is reduce your chances of getting burned food in different sides of the pot. It is also a cinch to clean. Food residues don’t get everywhere unlike traditional stove top where there are nooks and crannies that food and scum can easily get to. If you have tried removing stove top grates before after months of not cleaning them, it’s definitely an ugly sight. Glass stove tops need only to be wiped to keep them clean. Usually, the pots and pans suitable for a glass top stove have a heavy bottom. The reason why they are so heavy at the bottom is to stay stable on the surface and to conserve energy. They should have a smooth bottom surface, so they don’t scratch or crack the glass top stove with regular use – this is a must for a glass top stove. Using these pots and pans will ensure that you won’t have trouble with cleaning the surface of your glass stove top. They won’t leave behind soot or scratches that will make it more difficult to keep your glass stove top clean. This set came up very high in my search because it is recommended for glass top stoves numerous times. It is constructed out of heavy-gauge aluminum for even heating and looks quite interesting. There are 7.75-inch, and 11-inch fry pans, 1-quart and 2-quart sauce pans with lids, 5-quart Dutch oven with lid, 10.25-inch griddle, spoon, ladle, slotted spatula, use and care instructions and limited lifetime warranty information in this set. Every piece of cookware in this collection possesses a Thermo-spot indicator. The interior of pans and pots is lead and cadmium-free, and the whole set has a non-stick surface. There is a stainless-steel variation, so you can choose between the two. The handles have an ergonomic shape and are heat-resistant. They are well-built and comfortable to maneuver. The manufacturer states that all the items can be used in an oven up to 350 degrees F, giving these pots more flexibility. The set is dishwasher-safe, and most importantly, it fits glass stove tops very well, with perfect heat distribution. Furthermore, all items in the set are fast and easy to clean because of their non-stick exterior and interior. Using the best cookware for glass top stove like the T-fal C530SC Cookware Set ensures that you do not encounter issues with cleaning your glass stove top's surface. The first thing I noticed right out of the box are the tempered glass lids. I preferred these over the regular ones since I was able to see the food right through them. Every piece is covered in a non-stick coating, so cleaning was quite easy. I also tried washing the pots in the dishwasher and had no problems at all. The material used in the construction of this set is heavy gauge aluminum, so heat conduction was pretty good. The handles are made out of anti-slip silicone, very comfortable to hold and managed to stay cool. Included in the set: Covered Dutch oven 5-quart, covered casserole 3-quart, covered saucepan 1-quart, covered saucepan 2-quart, fry pan 8-inch, and fry pan 10-inch and 5-piece nylon tools. This being a Rachael Ray cooking line, I had to put this set to the test. The color is beautiful and striking. You’d be hard-pressed not to put it out for display. They feel quite sturdy but nothing too heavy, which is good for people who might not appreciate something that is too hefty. All parts of the set are made out of aluminum and sturdy hard enamel porcelain. They are PFOA-free and they also have a non-stick coating for easy cleaning. There are 2 covered saucepans (1-qt/3-qt), 1 6-qt covered stockpot, 2 skillets (8-in/10-in), 1 3-qt covered sauté pan, and 1 slotted turner and 1 spoon. The handles are rubberized stainless steel ones, and lids are all made out of shatter-resistant glass. Since they should be oven safe up to 400 degrees F, I used one pan in the oven to put it to a test and it proved fine. This set comes with a limited lifetime warranty included. This set is made of pure aluminum and stainless steel, so they were heating up very fast and even. It comes with break-resistant glass covers. Elements included: 1.0 Qt. Saucepan with cover, 2.0 Qt. Saucepan with cover, 3.0 Qt. Saucepan with cover, 3.0 Qt. Sauté with helper handle and cover, 8.0 Stockpot with cover,8” Non-Stick Skillet, 10" Skillet with cover, and 18cm Steamer Insert. I used these while cooking vegetables and the covers fit so well. They trap the moisture inside, so veggies were cooked in their own juices. The handles isolate the heat quite good. You can hold the pots and pans even with one hand. What I also liked are the drip-free pouring rims, which are very helpful. I tried this set also in the oven and had no problems with it, but on the stove, they need a longer time to heat up and be ready for cooking. It didn’t leave any markings on the surface of the glass. Calphalon has a right to brag about its nonstick coating formula. It really does its work in preventing food from sticking to the surface of the pots. With a hard-anodized aluminum construction, the heating was fast and even. This set might be ideal for you cooking enthusiasts out there, it’s durability and performance are solid, and the construction can’t be beaten. Even though it is solidly-built, it’s not that heavy. Handles are made out of silicone which proved to be comfortable for use. It passed the oven test, so you can use it in the oven as well. It’s not dishwasher-safe though but should be no trouble to wash by hand. Included in the box: 8-in. Omelet Pan, 10-in. Omelet Pan, 1.5-qt. Sauce Pan with cover 2.5-qt. Sauce Pan with cover, 3-qt. Sauté pan with cover 6-qt. Stockpot with cover. 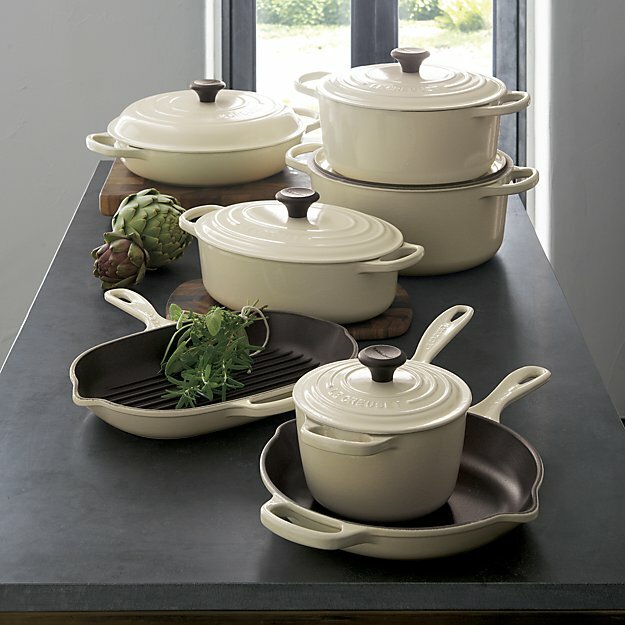 Cuisinart sets the bar high with this beautiful set of 12 pieces of cookware. 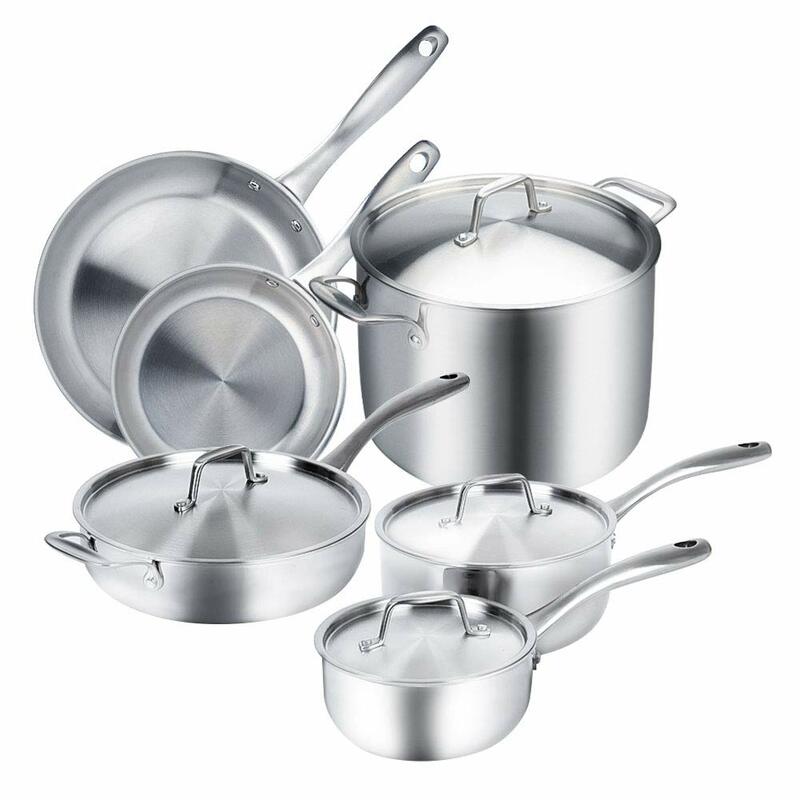 You get different sizes of saucepans, sauté pans, skillets and a stockpot that comes with a steamer insert. These are built to last with their Tri-Ply Construction and aluminum core. The exterior is made from brushed stainless steel to retain their shine for a longer time. The handles stay cool to the top and it features self-blasting lids that fit all the pieces perfectly. Heat is retained easily and evenly, thereby eliminating and avoiding hot spots. You can stick them in the oven for as high as 550 degrees Fahrenheit. This set has more pieces than other sets out there. It is a good choice if you are moving in a home and just starting with equipping your kitchen. All are completely dishwasher-safe. Even the covers can be safely washed in the dishwasher. The pouring rims are drip-free. You get moist food all the time, because of how well the cover seals all the moisture in. They can be used in the oven. These cookware pieces are built to last. They can still stain but the staining shouldn’t be hard to remove. 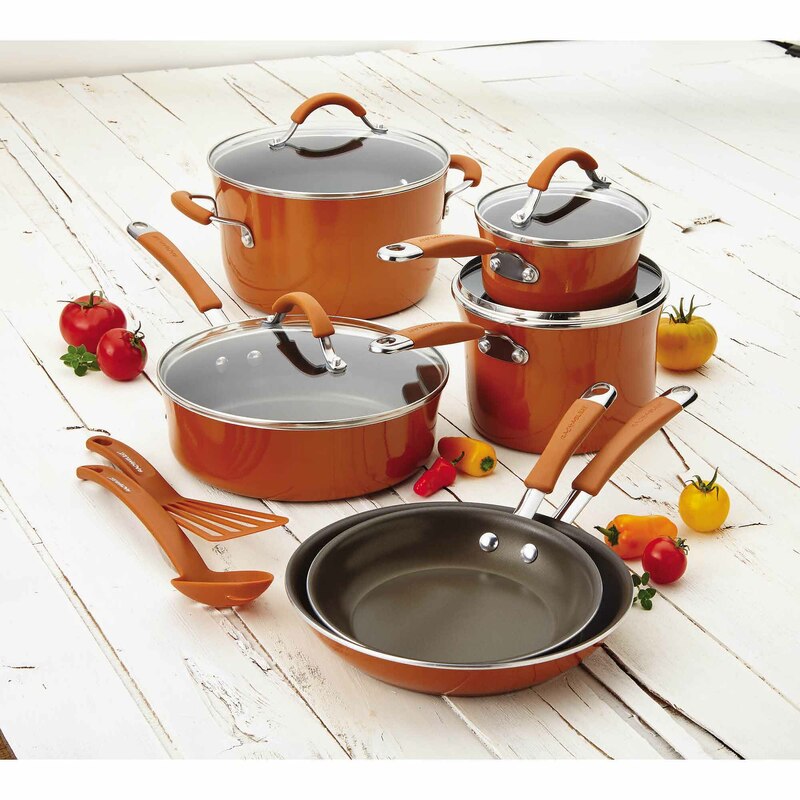 Make a style statement in your kitchen with this cookware set that features bronze exterior. It is as durable as it is beautiful, thanks to its hard-anodized construction. This type of material and construction render it two times harder than your standard stainless steel. The set includes everything you might need to be functional in the kitchen such as different sizes of saucepans, a stockpot, 2 sizes of skillets, a sauté pan and a shallow grill pan. Heat distribution is seamless and even withstands oven temperatures of up to 400 degrees Fahrenheit. While it isn’t dishwasher safe, it is ideal for different stove tops such as glass, electric, gas and ceramic. This is a beautiful set that you will be happy to display in your kitchen. The nonstick properties of the pan also extend to the outside. Heat distribution is stellar, making cooking a lot easier. It is made from hard-anodized material, which is harder than stainless steel. This comes with a triple-layer nonstick surface. The tempered glass lid is sturdy and allows you to check on your food easily. The pots and pans and the lids are safe in the oven in temperatures of up to 400 degrees Fahrenheit. There were those who said the nonstick pan is a pain to work with as food sticks to its surface. Here is a more affordable option that will not cut down the quality and number of useful cookware pieces to get. The set includes 2 different sizes of frying pans, one sauté pan that also includes a lid and 2 different sizes of saucepans. It also includes a sauce pot with a cover. All the pieces are made from tri-ply stainless steel construction for durability and have the ability to withstand temperatures of up to 550 degrees, making them ideal to use in the oven. This can double as storage for leftovers as the pieces are freezer-safe as well. This set is inexpensive, but you are still getting a lot of pieces. Everything looks sleek and beautiful. The pots and pans seem sturdy. They hold up well against a high level of abuse. They are safe to be used in the oven and safe in the freezer as well. There were those who said the lid weight did not match that of the rest of the pots and pans. Cookware with a flat bottom is much more efficient for a heat transfer. A flat bottom also makes sure that the cookware sits on the glass top in a stable manner, preventing the pot from moving around the surface. Also, this is important in preventing the cookware from inflicting damage to the glass material. You probably noticed the circle markings on the glass top stoves which mark a burner underneath it. You would want to find cookware that doesn’t have a bigger bottom than those markings. That will ensure more efficient distribution of heat. As for material, go for something durable, like stainless steel or hard anodized aluminum. Pay attention to the weight of the product; the heavier the product, the better the stability and heat conservation. These are the materials that are highly recommended for use on a glass top stove. If you end up choosing aluminum, note that it is highly reactive to acidic dishes. So, make sure it’s hard-anodized or coated with stainless steel. In my personal experience, transparent lids are the best. But it’s really an individual preference. Just make sure it fits your pot perfectly. Look for steam holes as well to prevent your pot from boiling over. Stainless steel might be the best choice if you’re going for the non-stick option. The flatter the surface is, the more slippery it will be, and so heavier cookware is recommended for use on the glass top stove. If it’s heavy enough, it will stay in its place, and you will avoid some serious accidents that may happen. But make sure it’s not too heavy, so you avoid the stovetop getting broken. Handles that stay cool allow users to hold the pot and pans without the need for a pot holder. But aside from heat isolation, also make sure the handle has an ergonomic and comfortable grip so cooking is easier. 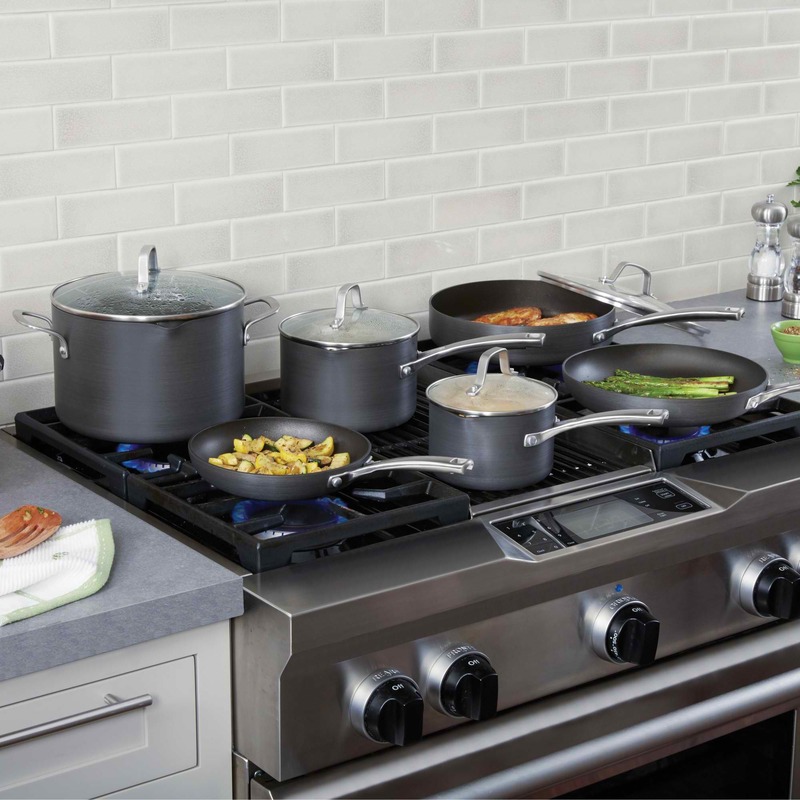 If you own an induction stove, make sure that the cookware you’re planning to purchase is compatible with it. Not all cookware ideal for glass top stoves have induction properties. While not an absolute necessity, this might be important for some. As I said before, non-stick is the easiest to clean, and it might be the best choice if you are using a dishwasher. If you are planning on using the product you want in the oven as well, make sure it will survive that kind of usage. Go for stainless steel options as they hold up better against higher temperatures. With these suggestions in mind, you might be wondering which of them is the best choice. All of them are highly recommended but it still boils down to personal preferences. 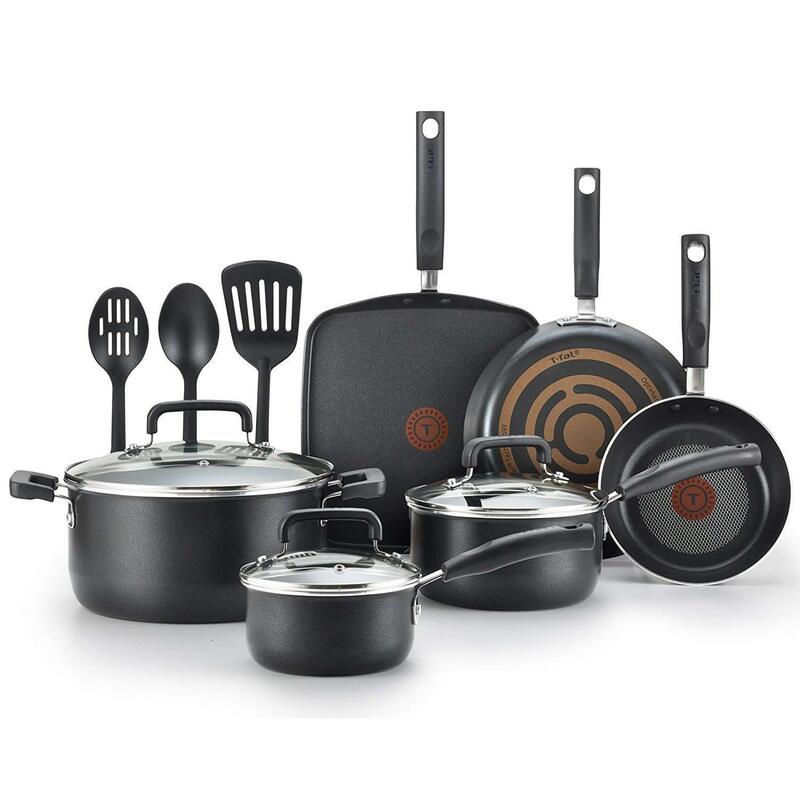 If you are looking for an entry-level and inexpensive cookware set, I suggest getting the T-Fal Cookware set and the Cook N Home 15 Piece Cookware Set. 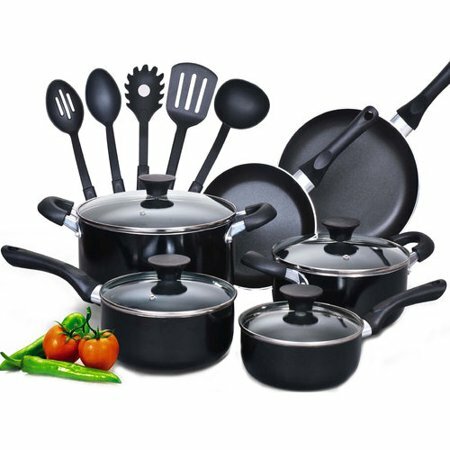 They are the best for the money because the price range for these cookware sets is more accessible. They are also great for small to medium-sized cooking needs. 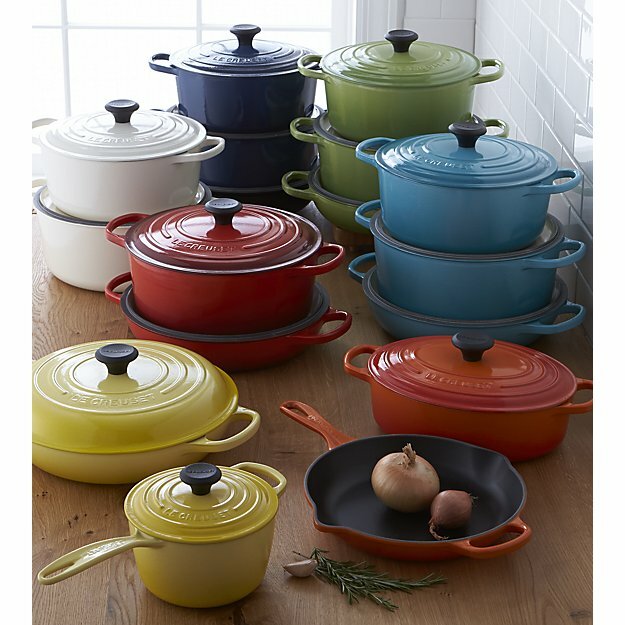 Go for the Rachael Ray cookware if you are looking for one with a mid-range price. It’s not that expensive but it’s not cheap either. It also makes you feel as if you are in a cooking channel, so beautiful are the pieces. These pots also add more color to your kitchen should you decide to display them. For investment pieces that will surely last you a long time, the Cuisinart Stainless Cookware Set and the Simply Calphalon Cookware Set won’t fail you. You need to wash them by hand to make them last longer but even with not enough care, they should still look like new even after many uses – ideal for those who cook a lot or those who like to entertain at home. 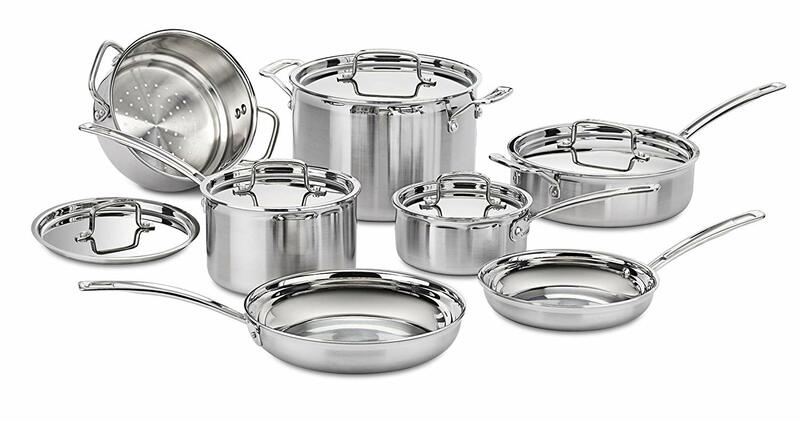 The Cuisinart Multiclad Pro Stainless Steel 12-Piece Cookware Set is a set that has been built to last. With their sturdy construction and beautiful design, you will be happy to use this set in your kitchen for many more years to come. 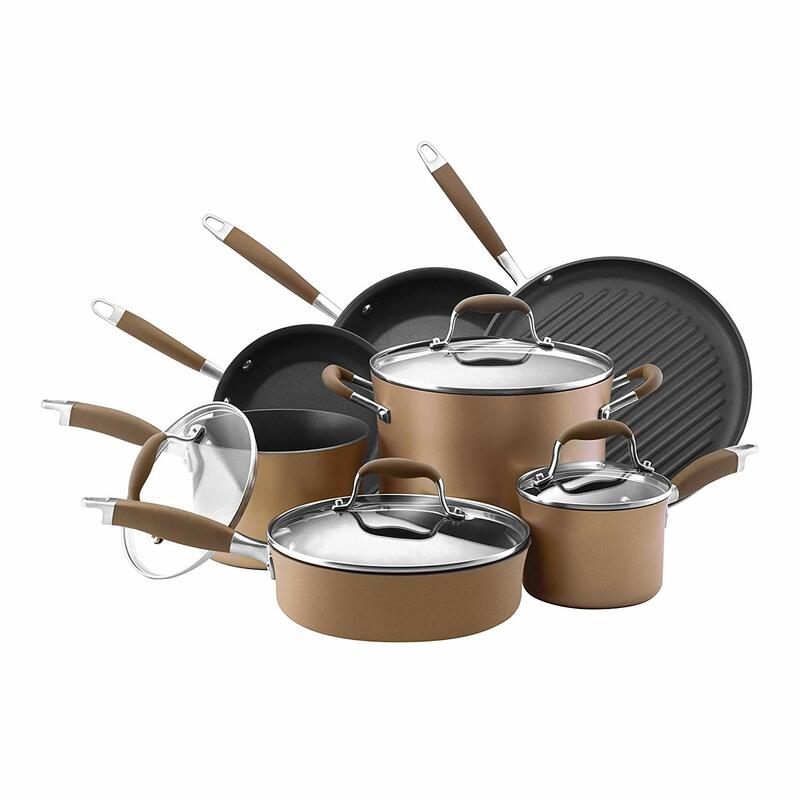 Being two times harder than stainless steel, the Anolon Advanced Bronze Hard Anodized Nonstick 11-Piece Cookware Set will likely last you for a lifetime. It is beautifully made and easily makes a statement in the room. The Duxtop Whole-Clad Tri-Ply Stainless Steel Cookware Set will not break the bank. This is the set to go for if you are on a tight budget and don’t fancy spending too much money on a cookware set. It doesn’t disappoint when it comes to quality though. It still has a good design and made from materials that can last for a long time. Looking for more cookware and kitchen cooking staples? Make sure you check out our homepage to find more suggestions on products that will make cooking at home a lot easier and more convenient.